A former jet settin’ ad executive who lived the good life from NYC to Key West, New Orleans & Hawaii. Deb traded in the champagne & caviar for something more substantial, the call of her heart. Deb sold all her material possessions & moved to Austin Texas, the LIVE MUSIC CAPITAL of the WORLD. When she got to Austin she sold her Mercedes Benz. Then she bought a blue Gibson Gospel guitar she nicknamed Baby Blue. She figures it was a fair trade. The first few months were not easy. First came the inevitable open mics. Then came the first “big gig” playing at a local grocery store. “I made the demo in my bathroom on my boom box,” recalls Deb. ”If I had known then how ridiculous that was I never would have done it.” Sometimes ignorance is bliss. With the hundred bucks she made from that gig, she put a down payment on a PA, and hasn’t looked back since. She played regularly with Baby Blue & her band, Deb & the Boys 4 - 8 nights a month all over Austin, at such prestigious venues as the Cactus Cafe, Threadgills,The Austin Fine Arts Festival, & The Hard Rock Cafe, San Antonio & Hills Cafe. Deb has been featured in a wide variety of news media, including Celebrate Austin 2003, The Austin American Statesman’s XL as “Band of the Week”, Texas Music magazine in 2001 & 2002, the Austin Music Network “Best of Texas”, Fox News 7, KXAN, KUT’s 90.5 fm “Folkways” and “Eklektiko’s”, “Sound of Our Town” & Jody Denberg’s Daily Demo on KGSR 107.1 and the innovative Americana station, KFAN 107.9. Deb was nominated for Humbletime’s “rising star female” award for two consecutive years with the Grammy Award winning Terri Hendrix & Susan Gibson also on the ballot. 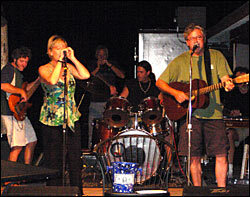 Deb Yager & the Boys were asked to play the annual Governor’s Mansion Texas Picnic in August 2003. In recognition of her growing impact on Austin’s music scene, the city declared January 27th, 2000 Deb Yager Day. Deb & the Boys have played Austin’s annual “Capital 10k” entertaining over 16,000 runners for the 3rd year in a row. 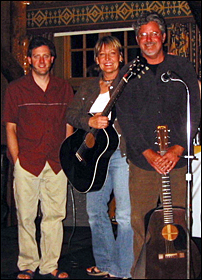 In 2003 Deb’s band opened for Gary P. Nunn (of Austin City Limits fame) and has opened for the Grammy award winning Terri Hendrix & Lloyd Maines at The Cactus Cafe. Deb combines heartfelt, down to earth lyrics with a “voice from heaven” (David Gold, Texas Music magazine.) She is equally capable of silencing a crowd with the vulnerable “My Secret” as she is with starting a groove with the powerful “Lonely & Blue”. Deb & Bo will be in the studio finishing up deb’s 1st CD she started in Austin at Flashpoint Studios with the Grammy Award winning Lloyd Maines, Chip Dolan, David Webb, Glen Fukanaga, Flash, Kenny Grimes & Paul Pearcy producing. featuring “This Kinda Love” Due out this year. 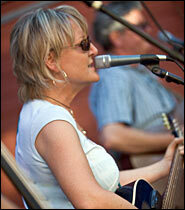 Deb is available as a duo act with Bo Reynolds as well as with her 4-piece band “LITTLE FISH”. Contact number (512) 771-0118 or (541) 383-9065 or debyager@debyager.com.